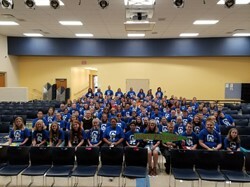 Students are enjoying a "Transitions Camp" at Gallia Academy Middle School to help prepare for the transition from elementary to middle school. The camp is part of the Healthy Kick Start initiative and allows students to meet their teachers, get acquainted with the building and class schedule, and develop new friendships. The camp is made possible through a joint collaboration between the Gallipolis City Schools, Gallia-Vinton Educational Service Center, and Gallia County Job & Family Services.